Our supply chain solutions are all about helping our customers by delivering speed and efficiency across their global supply chains and enabling margin enhancement and innovation. Breaking the mold of a traditional sourcing agent, we offer a range of solutions to mills, factories and other vendors helping them navigate supply chain complexity and increased compliance to accelerate the creation of sustainable supply chain solutions. 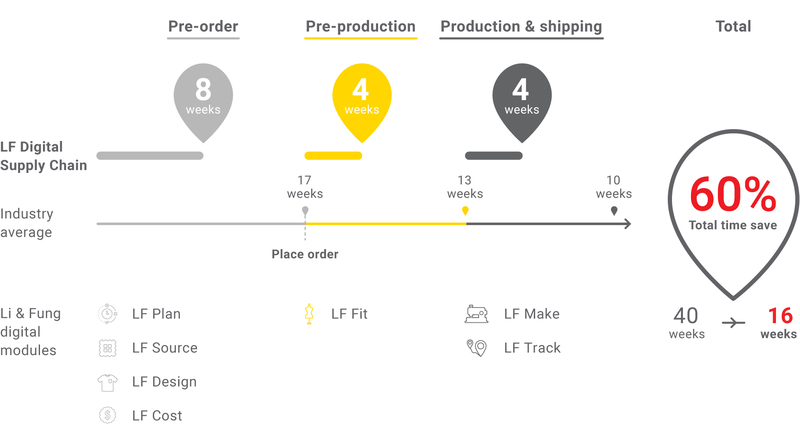 Through the LF Digital Platform we are building a range of tools for retailers and suppliers across four platforms: Materials Platform, 3D Design Platform, Production Platform and the Vendor Platform. A digitized materials marketplace will facilitate more efficient collaboration with mills and trim suppliers as fabric and trims are converted to digital assets allowing ease of discovery and building a collection of materials. This will also enable improved costing comparisons and benchmarks, allowing for robust and fast decision making. Virtual 3D design allows our partners to move quickly from proof of concept to testing and final design. Not only is sampling and adoption time cut from weeks to hours, the digital assets are reusable, allowing designs that can go directly to marketing or ecommerce sites and to be used for costing and future design. There is near zero incremental cost for product development iterations and waste from unnecessary samples and shipping is minimized. Through our Vendor Platform we can work with over 15,000 suppliers as partners, ensuring the best fit for any project in any capacity through our networks. We use dynamic costing tools that enable commercially-led merchandising, linking design decisions with business outcomes. Scenario-based analysis, forecasting and pre-costing with real-time changes is helping bring about speed, allowing for faster decisions and matching orders with the right factory. We are also developing an enhanced capacity management tool to improve production flow with factories, allowing our vendors to reap the benefits from increased operational efficiency and productivity and enhanced digital connectivity with Li & Fung. Other solutions for vendors and suppliers include: trade credit services, vendor compliance and sustainability, vendor supply chain services, manufacturing excellence, smart factory solutions. You can read more on our Supplier section. With our history of strong relationships with suppliers, our Production Platform, including our digital order tracking system and quality resource optimization tools keep us better connected with our myriad of suppliers in over 40 production markets around the globe. Having boots on the ground puts us closer to the needlepoint, bringing our customers specialist and timely insight and allowing us to work with vendors and factories real-time, meaning fewer layers and faster decisions. All the tools on our four platforms are collaborative and can be customized for each customer. With some of retails biggest successes build of speed, speed is a critical part of our strategy. Our aim is to increase speed like never before, helping our customers reduce production lead times and increase speed-to-market. This means making decisions closer to time to market, giving them quick response to trends, improved inventory control and decreased mark down – all with the aim of improving profitability. See how we are working to enable a speedier product cycle as illustrated below, taking the industry average of 40 weeks and slashing it 60% to 16 weeks.